Easter eggs abound in DC’s many TV shows. In this new recurring column, Couch Club member Joshua Lapin-Bertone digs up some of the month’s best, offering insights on what each of them is referencing…and speculation on what they might mean. During the episode “Gorilla Grodd vs. King Shark,” Nora doesn’t seem too concerned about facing villains with telepathic powers since she learned at the Flash Museum that speedsters are immune to mind control. The team tells her that the museum got that factoid wrong, but perhaps the curators got that tidbit from the comics! In the comics, Flash’s super speed and rapid healing gives his brain immunity to most forms of telepathic attack. Unfortunately, his television counterpart doesn’t have that same advantage. Anthro was an early Neanderthal dubbed “the first boy” when he debuted in Showcase #74. He later had his own series that lasted for six issues. Kamandi was a young boy trying his best to survive in a future version of Earth shattered by war. He was created by the legendary comic artist Jack Kirby and first appeared in the appropriately titled Kamandi, The Last Boy on Earth #1. The episode “Failure is an Option” also featured the Acid Master, a chemistry-themed villain who went up against Superman in Action Comics #348. During the episode, Brainy mentions a friend named Val. This is a reference to Val Armorr, Brainy’s Legion of Super-Heroes teammate known as the Karate Kid. The Karate Kid is trained in every form of martial arts and is known as “the living weapon.” He first debuted in Adventure Comics #346, decades before Ralph Macchio starred in the Karate Kid movies. By the way, did you know DC Comics is thanked in the ending credits for the first Karate Kid since they let Columbia Pictures use the name? It’s true! Go check it out! Supergirl’s Russian doppelganger had some cool developments as well. During the episode “The House of L,” she disguises herself by donning a brunette wig and calling herself Linda Lee. Linda Lee, of course, was Kara’s original secret identity when she first appeared in Action Comics #252, wig and all. By the end of the episode, “Linda” trades in her in disguise for a new costume and name. She’s now called the Red Daughter and sports a similar outfit to the one Superman wore in the Elseworlds story Superman: Red Son, an alternate-world story that imagined the Man of Steel being raised in the Soviet Union. 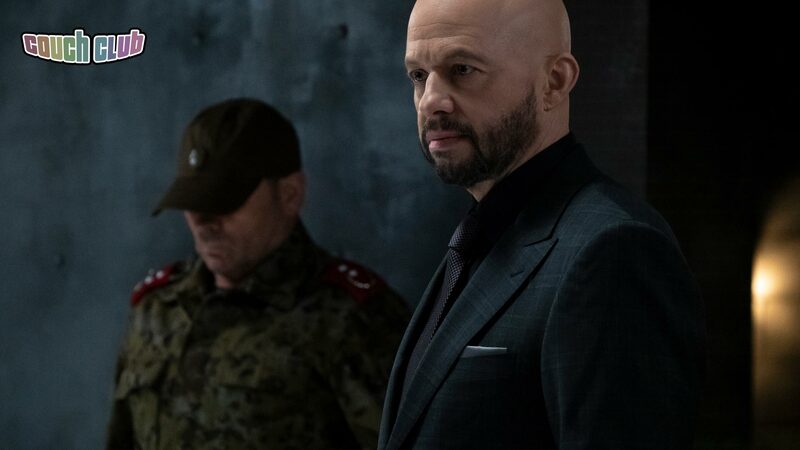 But let’s be real, the main event on Supergirl last month was the arrival of Jon Cryer as Lex Luthor! When we see Lex during a flashback in “O Brother, Where Art Thou?,” he has turned Earth’s sun red just like he had during the “War of the Supermen” comic storyline. Lex is also dying of cancer, which Lena assumes is due to Kryptonite poisoning. In the comics, Lex inadvertently gave himself cancer by wearing a Kryptonite ring. He eventually had to fake his death and transplant his brain into a healthy body. Then it got kind of weird. Lex wound up pretending to be his own Australian son and romanced a protoplasmic version of Supergirl. I mean, why wouldn’t you, I guess? During “The House of L,” we see Lex’s signature purple and green warsuit armor! Lex first built the battlesuit while he was on the planet Lexor (yeah, Lex named a planet after himself) in Action Comics #544. The suit became iconic after it was included in the Super Powers action figure toy line. Don’t you just hate it when your siblings don’t let you join their secret club? Oliver and Emiko were just starting to get along, but during the episode “Inheritance,” we learn that she’s secretly leading a terrorist organization known as the Ninth Circle. That secret society first appeared in Green Arrow: Rebirth #1, where Oliver and Black Canary took down one of their human trafficking auctions. Emiko was a member, but she was secretly working as a double agent to take the group down. Will her television counterpart make the same decision? Viewers were treated to a real blast from the past during the episode “Original Sin” when Gambi and the Pierce family found Jefferson’s original Black Lightning costume. Yes, he wore that outfit in the comics and yes, it looks ridiculous…but I love it! The costume debuted alongside Jefferson in 1977’s Black Lightning #1, and he didn’t get a new outfit until 1995. So, let’s not laugh TOO hard, shall we? Eighteen years is a pretty good run! The episode also features flashbacks to the death of Earl Clifford, another moment from Black Lightning #1. Earl’s body was left in the school’s basketball hoop to send a message to Jefferson. His feelings of guilt and anger arising from Earl’s death are what inspired him to become Black Lightning in the first place. That probably wasn’t the message the bad guys wanted to send. Last month, we talked about the super-villain team called the Masters of Disaster, and during the episode titled “The Alpha,” we met two more of their members! The fire-themed villain Heatstroke was a female named Joanne in the comics, but here she was gender swapped to become “Joe.” New Wave (the group leader who controls water) and Coldsnap (who controls ice) also debuted in March. By the way, remember the “Green Light Baby” named Wendy? In the comics, her and New Wave are sisters. Gotham might be in its final season, but it’s still managing to find new villains to adapt from the comics. During the episode “Nothing’s Shocking,” the Penguin is surprised when his meek accountant Arthur Penn shows up holding a ventriloquist dummy named…drumroll…Scarface! While Penn is timid like a mouse, Scarface has the attitude of Al Capone. The puppet Scarface and his handler the Ventriloquist first appeared in Detective Comics #583. At one point, Penguin mistakenly calls Arthur “Arnold,” which was the Ventriloquist’s real name in the comics. The No Man’s Land saga had a major turning point during the episode “I Am Bane” (the title of which is a pretty nifty Easter egg in and of itself) when Bane revealed that his secret employer was Nyssa, daughter of Ra’s al Ghul, who is out for revenge! While the comics version of No Man’s Land went down a different path, this is definitely reminiscent to the third Christopher Nolan Batman movie, The Dark Knight Rises, where Bane teamed up with Ra’s other daughter, Talia, to create what amounted to a different take on No Man’s Land! If you’re wondering where Doom Patrol is, don’t worry I’ve got you covered. Head on over to DC Universe, where I uncover the Easter eggs in each new episode of that show every week! That’s it for this month! March had plenty of great DCTV Easter eggs, and I can’t wait to see what the rest of April brings. Did you catch anything cool that I missed? Joshua Lapin-Bertone writes about TV, movies and comics for DCComics.com and DCUniverse.com, and is a regular contributor to the Couch Club, our weekly television column. Looking for more #DCTV Easter eggs? Be sure to check out Josh's weekly Doom Patrol Easter egg column on DCUniverse.com.